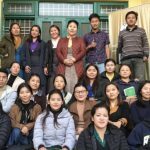 Dr Sangay, who has led the 150,000-odd Tibetan diaspora since 2011 when the Dalai Lama relinquished his political power, won more than 57 per cent of the almost 60,000 votes polled. The re-elected political leader of Tibetans in exile – Sikyong (Prime Minister of Tibetans in exile), Dr Lobsang Sangay on Friday declared that the “Middle Way” policy proposed by the 14th Dalai Lama Tenzin Gyatso, will remain as the official policy of the Central Tibetan Administration. 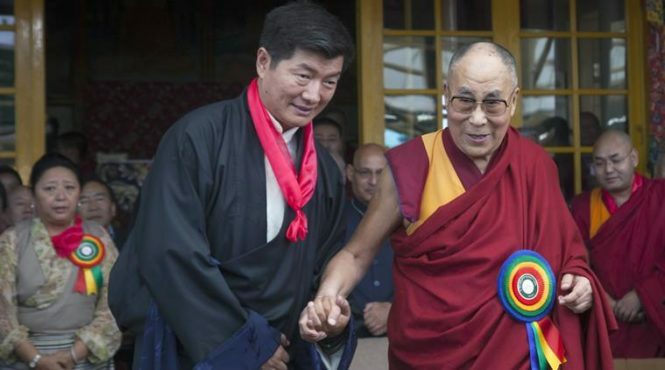 Dr Sangay, who has led the 150,000-odd Tibetan diaspora since 2011 when the Dalai Lama relinquished his political power, won more than 57 per cent of the almost 60,000 votes polled. He was sworn in, here on Friday as the exiled Tibetans’ Prime Minister for the second consecutive term of five years. The Speaker and Deputy Speaker will be sworn-in on May 31, while the other ministers shall take oath on June 1. 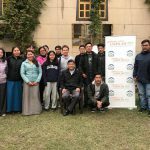 While delivering his inaugural address during a grand ceremony, in Dharamshala, Dr Sangay praised India for being a “perfect host” and said, “Among the refugees, Tibetan community might be the most successful and self-reliant community across the globe”. While addressing the gathering, Lobsang Sangay also requested Chinese government to resume dialogue with the “envoys of His Holiness the Dalai Lama” so that the issue of Tibetan can be resolved amicably. 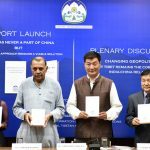 “The Middle Way Policy as envisioned by His Holiness the Dalai Lama and adopted unanimously as a policy by the Tibetan Parliament-in-Exile will continue to be the official policy. We are committed to make efforts towards the holding of talks between the envoys of His Holiness the Dalai Lama and the representatives of the Chinese government and resolve the issue of Tibet peacefully during His Holiness the Dalai Lama’s lifetime”, Sangay said. After the “negative” campaign by candidates for the post of Sikyong (prime minister) in the Tibetan Parliament in Exile (TPiE), both Lobsang Sangay and former Speaker of the TPiE were rebuked by the state oracles. Even the Dalai Lama had expressed his displeasure over the functioning of CTA in April, this year. During his address after taking oath as the Sikyong, Lobsang Sangay also sought Dalai Lama’s forgiveness. “In the recent election of the Sikyong and Chithue, there have been a series of unfortunate events that went counter to the Tibetan tradition of humility and good conduct. This has greatly saddened and disappointed His Holiness the Dalai Lama. We ceaselessly beg His Holiness the Dalai Lama for his forgiveness. We all firmly pledge not to repeat these misconduct in future”, Sangay said. “The Kashag (Cabinet) pledges to strive fully in realizing the aspirations of the Tibetan people in his lifetime”, Sangay added. 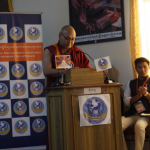 Referring to the self-immolation incidents inside Tibet, Sangya said, “Supreme sacrifices have been made by Tibetan brothers and sisters for the cause of Tibet. Since 2009, 144 Tibetans had self-immolated. Their sacrifices will not go in vain. I stand in solidarity with and express my sincere appreciation for the patriotic fervour that continues to burn in Tibet in all Tibetan hearts particularly the monastics, the scholars and writers, the teachers and students, the singers, the farmers and the nomads”. On the occasion, Sangay also announced another policy to be implemented by him during his second term, the policy, titled – five-fifty. “His Holiness the Dalai Lama has time and again advised us to hope for the best and prepare for the worst. Therefore, I had proposed the strategy of five-fifty. In the next five years, it is clear that we must put maximum efforts in achieving genuine autonomy for all Tibetans based on the Middle Way Approach. However, in case, we have to continue our struggle for many years, we need to strategize in order to strengthen and sustain our cause for the next 50 years. We have to protect and preserve our unique Tibetan identity and tradition. We need to build self-reliance in the Tibetan world, in both education and economy. Five-Fifty is a strategy for success. In five years we can achieve genuine autonomy or in the next fifty years China will gradually change for the better. Either way we will gain basic freedom”, Sangay said expressing hope that the exiled Tibetans shall surely be able to go back to Tibet during the lifetime of the Dalai Lama. 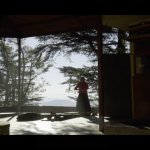 Besides various spiritual leaders of the Tibetan monasteries across the world, officials of Himachal Pradesh government and district administration of Kangra were also present on the occasion.